In the 1960s, 70s and early 80s, Londoners received ITV from it. In the 1990s it became the capital's Channel 5 transmitter site. Now work at the 153m tall transmitter tower at Croydon to provide a new antenna structure has enabled the tower to continue broadcasting TV signals across the surrounding area. The 16m high structure replaces the existing top section of the iconic London landmark. The old structure supported analogue TV, while the new structure is designed for high power digital terrestrial TV (Freeview) transmissions, providing a back-up for the nearby Crystal Palace mast, the current primary TV transmitter site in London. Croydon is also used as a transmitter site for local TV as well as for numerous FM and DAB services. The works are being managed by communications engineering company, The Bridge Networks North Ltd, who are undertaking the upgrade at Croydon, on behalf of site operator, Arqiva. In order to minimise service disruption, the Bridge Networks North used a twin-engine Super Puma AS332C helicopter. 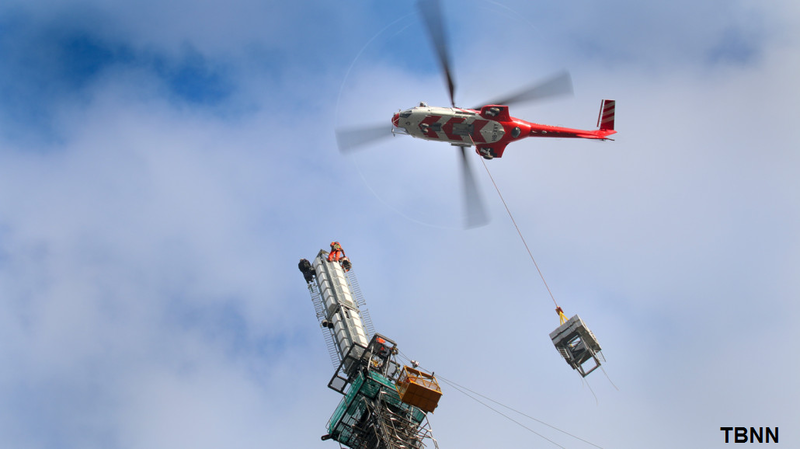 Although helicopter lifts are a relatively common method for installing equipment onto transmission masts and towers, this is the first time that the technique has been used on one of the capital’s transmission structures. Prior to installation, the helicopter removed the tower’s existing antenna structure. The 10 tonne new structure was lifted in three sections for The Bridge Networks rigging team to fix into place. The Bridge Networks North is currently delivering a number of key communications infrastructure projects throughout the UK and Australia within the broadcast, telecoms and public sectors.